Buehler, an ITW Company of specialty material testing equipment and consumables is offering SumMet™ Metallography classes in the United States and Europe. Buehler's SumMet courses train today's Laboratory Technicians on the latest techniques for metallography, material preparation and analysis. Dr. Mike Keeble states, “The fundamentals of sectioning, mounting, grinding and polishing are covered both in theory and practice in this course. They are based on the SumMet methods developed at Buehler since 1936." Buehler, an ITW Company is offering SumMet™ Metallography classes in the United States, Germany and the United Kingdom. SumMet™ Fundamentals of Metallographic Techniques is a three-day course designed for both lab technicians without formal training and experienced metallographers who want to learn the latest preparation techniques. Classes will be held at the Buehler headquarters in Lake Bluff, Illinois and in the company’s laboratories in Düsseldorf and Esslingen in Germany, and Coventry in the United Kingdom. In Duesseldorf, Germany the class is taught by Matthias Pascher, Buehler Product manager for hardness testing and imaging analysis. Mr Pascher has extensive applications support in metallography, hardness testing and imaging analysis combined with a solid background in material science. Technicians and engineers can register on the Buehler website . 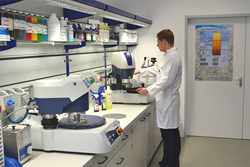 Buehler maintains an extensive network of laboratory specialists, sales engineers, distributors and service engineering teams that are available to meet with customers worldwide. The company innovates solutions and offers expert service and support throughout the materials preparation and analysis market. To see the complete product offering, please visit Buehler. For additional information, contact 1-847-295-6500 or email marketing(at)buehler(dot)com. In 2006, Buehler was acquired by ITW, a developer and processor of engineered components, industrial systems and consumables. ITW is a global, Fortune 200 company with 51,000 employees across 56 countries. For additional information on ITW please visit http://www.itw.com .